The crash kills. A driver lives. Yet, there’s a 98 percent chance that driver won’t be tested for booze. Donna Mogan holds a photograph of her daughter Michelle Vibert, who was killed in August when her car was struck by a police cruiser on the Southeast Expressway in Dorchester. 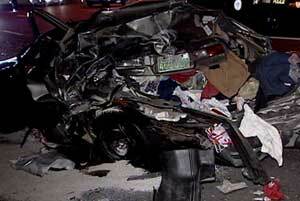 Massachusetts is the worst in the nation at finding out who’s been drinking, driving and causing deadly crashes. 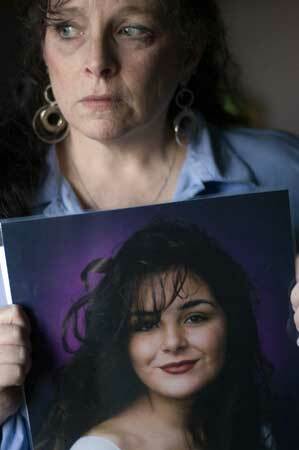 Joe and Donna Mogan’s daughter is dead, and they want to know why. 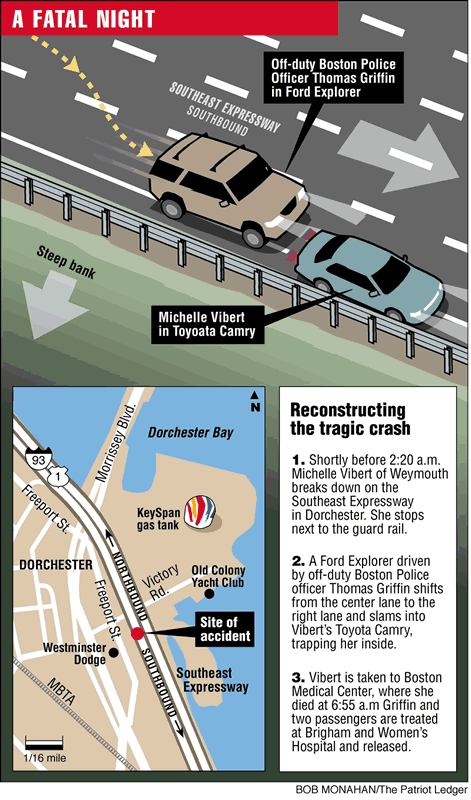 Michelle Vibert, a 29-year-old mother of two from Weymouth, was killed Aug. 12 in a crash on the Southeast Expressway near the Dorchester gas tank. Donna and Joe Mogan outside of their South Boston home with their son Joseph. The Mogan family is furious, saying the cause of crash that killed their daughter in August has not been investigated enough by police. Her Toyota Camry had broken down at 2 a.m. and was rammed from behind by an off-duty policeman in a Ford Explorer. The accident occurred at a time of night when the National Highway Transportation Safety Administration says drunken drivers cause 60 percent of fatal accidents. The Mogans want to know how a sober driver could have plowed into a car stopped with its hazard lights flashing on a clear, dry night. They want to know why state troopers didn’t give a sobriety or Breathalyzer test to the driver who hit her, Boston Police officer Thomas M. Griffin, 27. The Mogans want to know if Griffin got a break because he is a policeman. State Police insist he did not. In fact, the statistics show that Griffin was treated like the vast majority of drivers in fatal accidents in Massachusetts: almost none are tested for alcohol. Surviving drivers were tested in only five of 296 fatal crashes in Massachusetts last year. That’s 1.7 percent, lowest in the country. According to the National Highway Traffic Safety Administration, the national average was 31 percent. The federal agency has pushed for years to test all drivers involved in deadly accidents. But nine states, including Massachusetts, still do not require or even recommend blood-alcohol testing of surviving drivers in fatal crashes. State Police Lt. Eric Anderson said Griffin did not receive preferential treatment. Anderson also said the troopers did not administer tests at the scene of the accident because Griffin was injured. “They were unable to give him any sobriety tests,” he said. Click to enlarge graphic showing details of accident. The rear of Vibert’s sedan was demolished by Thomas Griffin’s sports utility vehicle. The accident remains under investigation by the Suffolk County District Attorney’s office. No charges have been filed. Although Griffin was not tested, Vibert was. Massachusetts tests nine out of 10 victims of fatal crashes as part of routine autopsies. On the night she died, Vibert had been out dancing with her cousins in the city. “The toxicology test on Michelle showed she had one drink,” her father said. But in the case of drivers who survive, police have virtually complete discretion to decide whom to test and when. “Every stop is going to be different,” said State Police Trooper Stephen Mullaney, who trains state and local police on highway safety, including Breathalyzer testing. Officers are taught to look for signs such as an odor of alcohol, “open containers, glassy eyes, slurred speech, fumbling fingers,” Mullaney said. “If you have a reasonable suspicion that a person is impaired, you perform a field sobriety test and ask for a Breathalyzer,” he said. Mullaney said the fact that someone dies in a crash does not make him more likely to suspect that alcohol was involved, and just because someone was drinking does not mean he or she was drunk. “Just because they tell me they’ve had a cocktail, that doesn’t mean they’re impaired,” he said. Stephen Jones, a Norwell lawyer who represents defendants in drunken-driving cases, agrees. “There’s a lot of misconceptions about this area of the law,” Jones said. “Not every fatal accident involves alcohol. As a result, police need to make a determination on-scene whether the person’s been drinking. “As far as a field sobriety test goes, you have to have some suspicion the person is under the influence before you administer that,” he said. Jones, who wrote a book for lawyers on defending drunken drivers, claims to have won 500 cases. His advice to drivers: don’t agree to field sobriety or blood-alcohol tests. Refusal to submit to a test can cost a driver his license, but it cannot be used in court. Efforts to reach Griffin and the two passengers in his car, including one who was an MBTA police officer, were unsuccessful. Vibert’s husband, John, declined through the Mogans to be interviewed. The Suffolk County District Attorney’s office also declined to answer questions about the accident before the investigation is finished. A spokeswoman for the Boston Police Department said it is not investigating Griffin. The lack of an alcohol test is not the only issue for the Mogans. Whether drinking is suspected, vehicular homicide charges are routine in fatal accidents if the driver who was determined to be at fault survives. Charges are usually brought within a few days, but in some cases it takes months. The Mogans remain concerned that, because Griffin is a police officer, their daughter’s accident won’t be investigated as thoroughly as it would have been if he were a civilian. On Saturday, they will hold a candlelight vigil at 5 p.m. in front of Boston Police Headquarters on Tremont Street. Mogan said it will be “a peaceful reminder of the senseless death of our daughter” - and a notice to the district attorney that they expect justice. Julie Jette may be reached at jjette@ledger.com. Sue Reinert may be reached at sreinert@ledger.com. Massachusetts has no law requiring alcohol testing, but five other states do. Drivers involved in fatal accidents in New Hampshire have no right to refuse blood-alcohol tests if they’re suspected of causing the crash. “The officer can actually, if need be, restrain the person physically while the blood is being withdrawn,” said Earl Sweeney, assistant commissioner of public safety in New Hampshire. Maine has the same policy, but it applies to all fatal accidents regardless of who’s at fault. Maine tests 77 percent of drivers involved in fatal crashes, second only to South Carolina’s 94 percent. New Hampshire tested 32 percent, slightly above the national average. But in Massachusetts, police can ask drivers to take a test only after they’ve been arrested for drunk driving. Here, the number tested is less than 2 percent. No other state tests so few drivers. Massachusetts has no law requiring alcohol testing. Police can only ask drivers to take a blood or breath test after they have been arrested for drunken driving. That’s not the way in works in states where testing is mandatory. Fowle, the Kennebec County prosecutor, said the Maine law has survived legal challenges because police must have probable cause that a person was drunk before test results will be admitted in court. Massachusetts leaves testing decisions completely up to police officers. Drivers can lose their license for life for refusing a test, but some are never asked. On Halloween night, for example, five teenagers were injured in Quincy when a car driven by a 17-year-old crashed through a fence, hit a tree and rolled over. Beer cans surrounded the overturned car when police arrived. Capt. John Dougan said the officer who responded to the accident reported that the driver appeared to be sober and did not test her. As an under-18 driver, she was not allowed to have any alcohol in her system. If she had refused a test, she would have lost her license for four years. Legal and practical barriers also impede testing in Massachusetts. Many surviving drivers end up in the emergency room. Police officers do not test injured drivers, and prosecutors must seek medical records in court. It’s unclear if an officer can ask a hospital to test a patient. Andrea Nardone, spokeswoman for the Massachusetts District Attorney’s Association, said police can never request a blood test. State Police Trooper Stephen Mullaney said police can request a test for a person who has been arrested. Hospitals are sometimes reluctant to test because some health insurance policies don’t cover treatment for intoxicated patients. Liability insurance does not cover people who drive drunk. In that case, a victim cannot collect on the driver’s insurance, but must instead sue the person, who often lacks assets as well as insurance. In another hurdle for testing, not all police cruisers carry the equipment. Despite the obstacles, advocates for tougher drunken driving laws strongly support mandatory testing. “The more you test the more opportunity to deter drunk driving,” said David Deiuliis, spokesman for the Massachusetts chapter of Mothers Against Drunk Driving. “It sends a message to the public that if you choose to drink and get behind the wheel of a car, there will be enforcement,” he said.